Making patterns for printing with hot glue and cardboard is a time honored way to play. But how do you get the hot glue uniformly smooth for the best printing? What’s the no fumble way to use them when printing? 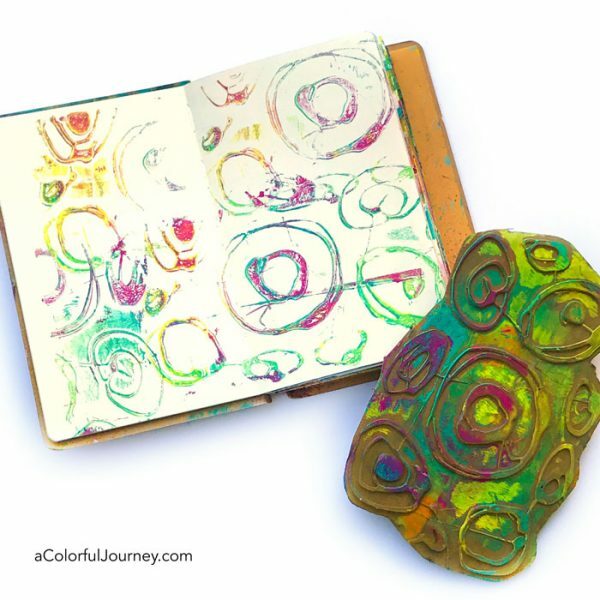 How can you stamp a good impression in an art journal using regular acrylic paint (and this used to frustrate me so much until I found a solution)? All these secrets are revealed in the video below. Okay, secrets may be a bit dramatic but they are the tips and tricks that I learned while playing with the Gel Press plate. Watch Tips and tricks for how to make hot glue pattern making stamps on YouTube. When I stamp with homemade hot glue pattern stamps and acrylic paint directly onto paper, the image is spotty at best. The paint had to be loaded on it, and then only some of it transferred. Lots of wasted paint, disappointment and frustration. But if I stamp onto a Gel Press plate, then quickly take the print of it, I get a whole lot of the pattern and detail. 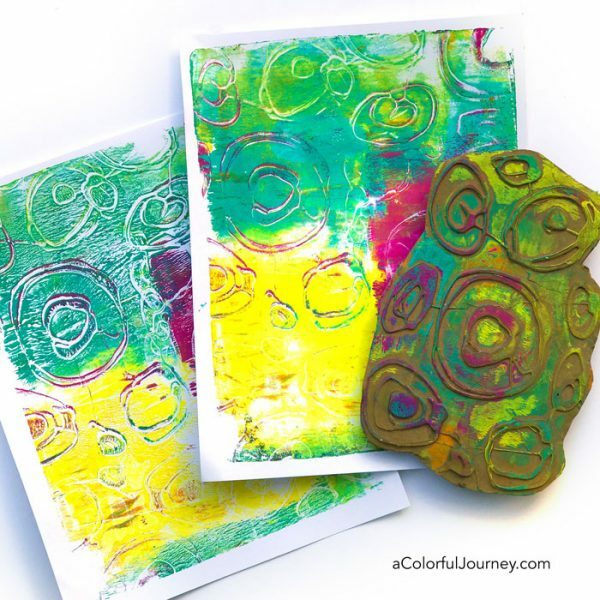 All the wonderful color mixtures here, all loaded up on the stamp while making a traditional gel print, transferred directly onto the art journal page. All those wibbly wobbly circles in my journal make me so happy and the big trick for doing this is to have the paper or art journal right next to you and ready, since the paint is so thin it will dry very quickly. I was so excited about this big circles stamp, I totally forgot to play with the single circle I made in the video! OOPS! Twist my arm…guess that means I need to go and make some more prints! Curious to know more about gel printing? I’ve got a step by step video and downloadable guide to get you started. 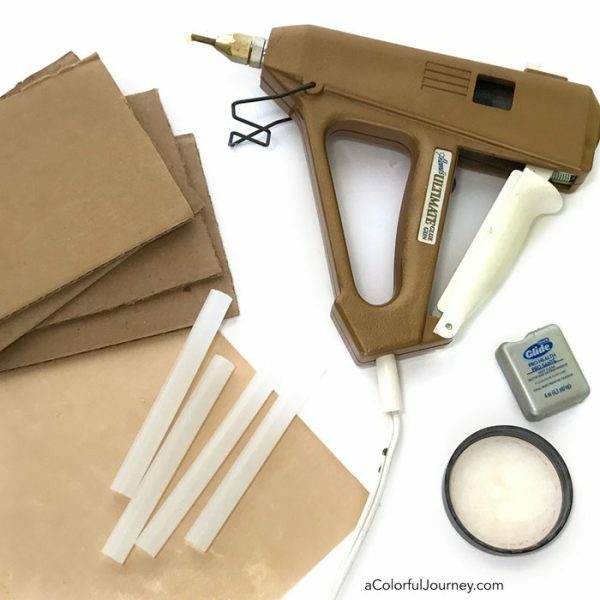 Great information on making stencils and hot glue. If you pull the stencil off the kraft mat before it is cool and you get a rough glue area, you can melt that area with the tip of the hot glue gun and smooth it out a little. Or add more glue and restick it to cool. I love the results you get – such lovely prints! I’ll have to give it a try. Thanks for the tutorial. And also thank you for the written instruction. So I can take a fast look when I forgot about something. I tried it right away. Thanks for your great inspirations and confidence boosts. And THIS is why you’re the best teacher. Thank you so very much for sharing all your fun technique! I am definitely a big fan of yours !